A classic of classics of Cuban posters, this 1969 poster for the ICAIC's Cine Movil (Mobile Cinema) project is simplicity itself. Charlie Chaplin on wheels represents the mobile cinema - a lorry that travelled into the Cuban interior to show films to the campesinos. Bachs' poster for the ICAIC is great. Confident, fun and nicely childish. As a designer Bachs' preferred to produce posters for childrens' films and this is typical of his cheeky design ideas. A Mexican experimental film with three directors and three parts sounds like a wacky idea but Bachs' poster for the ICAIC is restrained and formal with a proper typeface and simple three column layout. Once again his trademark use of simple colours and shapes define characters and make great use of silkscreen printing. Nosotros is a 1977 Cuban documentary by Luis Felipe Bernaza about the Cuban poet Regino Pedroso who I believe wrote a poem entitled The Freedom Train. Reboiro used a lot of technical drawings in his posters and this is typical of his mixture of the traditional and modern, mixing geometric shapes, bold colour and fine line drawing. La Primera Carga al Machete (The First Charge of the Machete) is a Cuban documentary by Manuel Octavio Gómez that tells the story of the 1868 uprising against Spanish colonials. Although the message of the film is serious it uses cinematic experimentation and playful techniques to bring contemporary film making to the 19th century battle. It also uses wild hand held camera shots and an abstract style that can be hard work to watch. Oliva's poster steals heavily from the San Francisco scene of the late 60s. Although American poster art was not officially available in Cuba the Cuban artists got hold of various publications that were passed round and appropriated. In this case Oliva's poster may have been a little bit too American in style as another version of this Cuban poster exists to promote the film in France. This is great though and its wild style really waves two fingers at the authorities. Edmond Keosaian's 1966 Soviet western Elusive Avengers (Неуловимые мстители) is a colour cult classic featuring a gang of four protecting a village from bandits. Working with silkscreen printing creates major limitations for artists, who find that having to stick to flat colours and simple shapes can be restrictive. As the Cuban poster artists grew into the medium they started to create work that made the most of the limitations. In this poster Bachs has used very simple shapes to create a vibrant image to represent the simple peasant dress of the film's characters. The artistic style and shape of the text is Bachs' trademark. This OSPAAAL poster by Alfredo Rostgaard is unusual for a number of reasons. It is originally a painting that mimics religious iconography through its use of classical and renaissance artistic techniques. This is Christ, framed with a gold leaf halo, carrying a rifle - the ultimate revolutionary, a true believer. 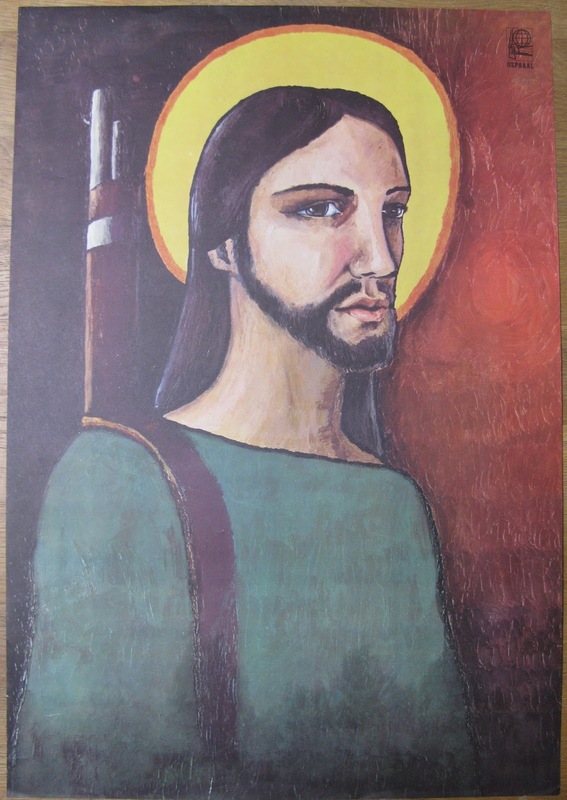 What is a surprise is the use of Christ as an icon for the Cuban revolution. Castro and the Cuban Government were very anti-religion, even banning the celebration of Christmas day from 1969. Once again though this is a very confident graphical statement and a great poster.